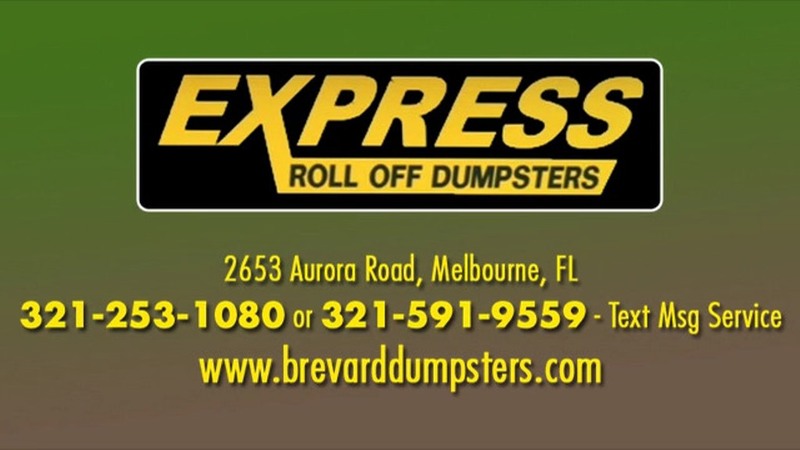 Need a roll off dumpster rental anywhere in Brevard County Florida? Live in the 10th largest City in Florida- Palm Bay and need dumpster service? Don’t call waste management Call Express Roll Off dumpster rental to compare pricing and save money with us! We post our ratesand rental terms right on our web site, so don’t pay waste management dumpster rental prices when our prices our less than half of what they charge and we allow you to rent a dumpster for a longer duration of time. Express Hauling has serviced the Space Coast of Florida for more than twelve years. We service Melbourne and beyond - every city in Brevard County Florida We offer a wide variety of dumpster sizes to suit your project. Our most popular roll off containers sizes are: 10 yd dumpster (widely used by home owners for junk removal and DIY projects), 20 yard dumpster (perfect for debris removal and mid-sized to Larger Projects- such as a re-roof), and the 30 yard dumpster (ideal for construction debris removal or know as a commercial dumpster – used for construction dumpster rental . Express roll off dumpster services Melbourne, Palm Bay, Cocoa, Merritt Island, Titusville, and the surrounding areas of Coastal Central Florida’s top choice when you need local dumpster quick or garbage container rental . We are family owned and operated; by a former veteran of the US Navy. Express hauling services is licensed and insured and there when you need us; offering same day service! 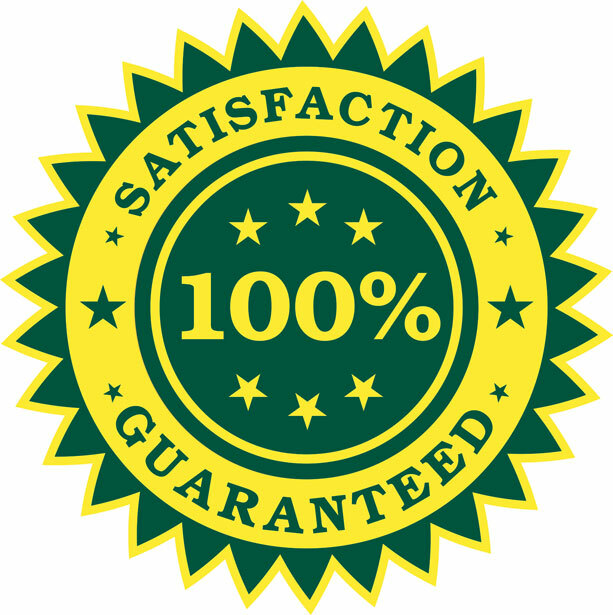 Why put other dumpster companies to the test; when Express dumpsters is undoubtedly the best! Click here to Check out our latest Blog article about why our dumpster service for roofers and landscapers costs less than using your own dump trailer. developers, property managers, and subcontractors of all types. Roofers, pavers, restoration, remodeling, tile and stone contractors and more. We have heavy tandem axle trucks trucks for your heavy hauling needs. wondering; "what size dumpster do I need for my home?" art equipment to better serve your dumpster rental and hauling needs. 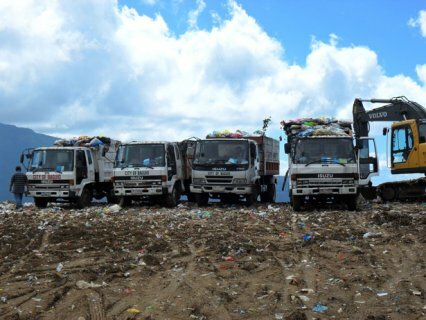 (10/02/2015) Most of the larger roofing companies purchased their own dump trailers with the intention of saving lots of money dumping roofing debris themselves. 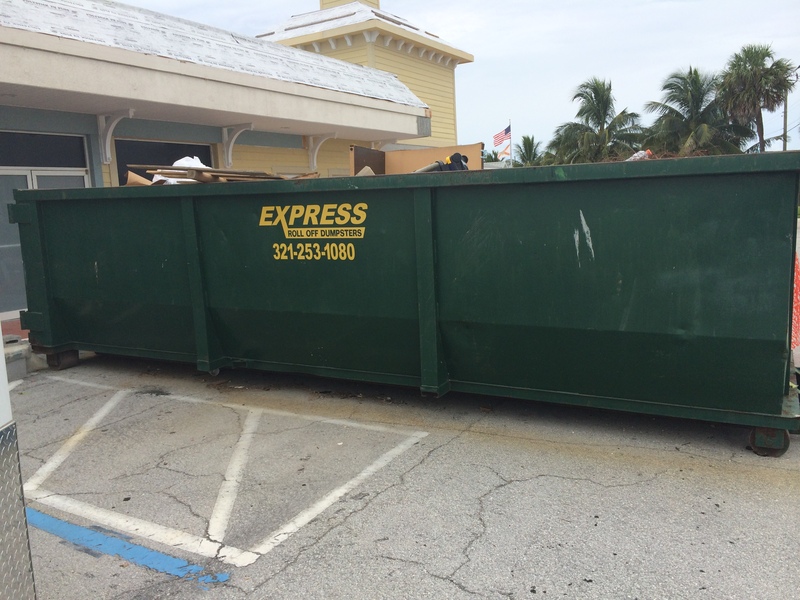 Allow Express Roll off Dumpsters, your local dumpster company in Palm Bay and the surrounding cities in Brevard County, Florida to break down the actual costs to our self-employed roofing contractors. Please bear in mind we are assuming your dump trailer is owned outright in this scenario without a monthly payment. Roofing contractors in Melbourne should rent a dumpster from Express Roll Off because: We can save your roofing company on fuel costs. That’s right, good old gas is a hefty expense every month- we are certain of this. These trips from job site to the dump (depending on where the re-roofs or roof repairs is located may be $20 - $50 dollars in fuel/per trip. We can save roofing contractors precious payroll expenses. The average roofer makes $15.60 per hour according to and this does not include his overtime wages, workman’s compensation insurance, the 941 payroll contributions we business owners pay, re-employment, and/or any other benefits that an employer may invest in their staff. Trips to and from the dump, providing the lines move rather quickly can take two to two and a half hours. With just one employee in the truck dumping these materials this can cost your company $30 - $45/per trip. Save your sense of smell. The dump stinks. It’s free to dump roofing debris; but it is gross. Your trucks will get dirty, it smells, and the seagulls love to take a dump on your windshield. Save on mileage which in turn leads to breakdowns with the additional wear and tear on your truck- not to mention the heavy hauling your vehicle is doing by towing the extra weight around. At close to $.60/mile ($.575 per mile to be exact). A 43 mile round trip is going to cost you roughly $25 in wear and tear figures the IRS and we can assume this is a “low-ball” number. Save on slack! We all know how hard it is to keep your employees focused. Making an extra trip to the dump isn’t exactly going to motivate your workers. If anything the trip will end up turning into a convenience store run, barrage of phone calls, and even a chain smoking break. The money our dumpster service can save you here is priceless. 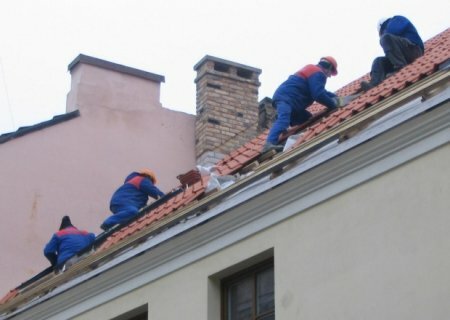 Self-employed Roofing Contractors can also save on Workman’s compensation of $18.62 per hundred spent. For every 2 trips at the dump (which may be how many times you go for one small roofing job) we can save you close to $20 right here. Save on Trips from job site to the dump. If your dump trailer is filled to the gills you can maybe haul 5 tons of debris (equivalent to 8 yards), whereas with our rolloff dumpsters, you will be able to fit more than double this amount- and we dump it for you. Our standard ‘roofer-friendly’ dumpster measures 17.5 feet long x 4.5 ft tall- call for our roofers rates and save $50. 321-253-1080 Express Roll off Dumpsters can save you money on tire replacement. We all know the dump is loaded with nails. How many times have you had to replace a tire(s) just because you drove to the local landfill? This can be costly, ranging from $120 - $220 per tire, plus labor and possible roadside assistance costs. Save on DOT fines. Tarping your trailer can be a pain but could lead to costly fines if you neglect to do so. These fees and fines can cost time and up to $170 . Your Company can also be subject to other moving violations and/or lawsuits due to this. If your tarp isn’t properly secured you run the risk of causing accidents on the road and getting charged for littering. Not to mention your auto insurance rate can go up.Save your reputation and potential referrals. The landfill closes at 5:30PM; this potentially tears your crew (or part of your work force) away from the job site early. They would have to leave at 4:00PM for instance to get to the dump and come back to your place of business. This is an hour and a half of lost work per employee. If we want to keep our word to our valued customers, we must deliver our services within the promised timeline. Keeping your customers happy is priceless and reason enough to shoot us a text letting us know where and when you need a dumpster. 321-591-9559 Overall cost Savings by using Express Roll off Dumpsters: Fuel $20-$50 (depending on location) Save on time- payroll spent $30-$45 0 But save on a potential truck wash and your olfactory senses. Save on mileage. $25. At $.60/mile Keeping job focus- priceless Save on workman's comp insurance. $20 Fit more in our 17 yard cans. 2 trips double the above numbers Save on your tires. $120-$220. Plus labor ~ minimum $30 for a tire plug Tarping is a pain that could lead to fines. 0-$169 The dump closes at 5. This tears your crew away from finishing your customer's job. - priceless Save $170 plus time delay on overall job (if nothing happens to tires- and no repairs) and provided you own your dump trailer free and clear~ multiply this number by two for every trip you make with your 8 yard dump trailer. Save $340 if you’re dumping 17 yards of material (which is what we find the average re-roof job to take). To read more pros and cons about using your own dump trailer on the job site and its cost effectiveness (this is a blog written by other roofing contractors in various states click here). Save time and money overall and give Express A call 321-253-1080 Brevard County Roofers mention our $50 off savings for Roofing Contractors.